Hi – I used to live in Blackheath (on the Lane, in Blackheath Park/Cator Estate, then Southvale Road) and although I don’t any more, I have a great fondness for the place and I love reading your blog. I saw your comment about the Mysterious Pond – apologies if you know all this already, but if not I might be able to shed some light on it. Living in Blackheath Park, I was always fascinated by the story of Wricklemarsh House (Neil covers it at length so I won’t give the whole story!) and used to spend time trying to track down any remnants of it. Right slap bang in the middle, you’ve got the Grand House – and a wonderful piece of Georgian bling it was too, as these pictures will show. It must have had great views up there at the top of the hill, although interesting it faced away from London, not towards it. What we’re interested in are its formal gardens and especially the round pound to the north of the house. Although the house was demolished, the pond remained for many years after – hence ‘Pond Road’, and the kink in the road, as it travels round it just north of the railway bridge. The pond was drained at some point in the 20th century, not sure when, but it’s still very obvious where it was. If you stand at the junction of the South Row and Pond Road, you’re at the entrance to the grounds of the old house, and I enjoyed standing there, picturing the grand avenue leading up the hill, with the road to the house following Pond Road up the hill, with the avenue of trees on either side. Once you’ve over the bridge, Pond Road is still a grand road, and I used to wonder if some of the ancient trees on either side might pre-date the houses and have come from that avenue. 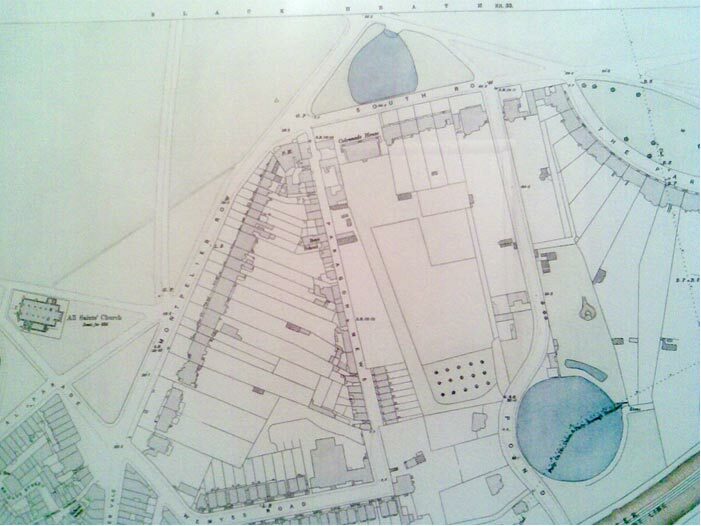 When you reach the junction of Pond Road and Blackheath Park, you’re standing exactly where Wricklemarsh stood. 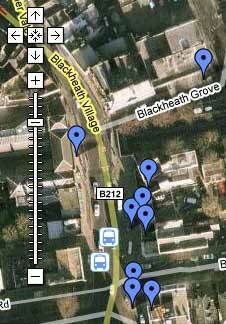 Another avenue of trees would continue down what is now Foxes Dale, and another would run east-west along Blackheath Park Road itself – again, I look at the ancient trees along there, and I wonder if they were planted at the time of the grand house. However, even more interesting is the *other* pond. Looking back at the old map, you’ll see another pond to the south, fed by a small stream called the ‘Kid’ (hence Kidbrooke). ‘Brookway’, off Foxes Dale, is another clue to its path. Now, that pond has *mostly* been drained, but a small ornamental area of it still remains. Go east, along Brookway, to the Casterbridge estate – and there, in the middle, is a pond – a pond I’m quite confident that was part of the grounds of Wricklemarsh. Look closely at the island – you’ll see there’s a still a bit of decorative statuary remain, and there’s an ornate little bridge too (I hope, anyway, it’s been a while and my memory isn’t 100% reliable). It’s all still there on this Google map. And what of the Wricklemarsh – well, James Cator knocked it down and developed the estate, but he did keep that wonderful collonnaded front for his own house. These videos really show how the cat flew through the air – pawing the wind like water as it went! Thanks to Ben for sending them in. 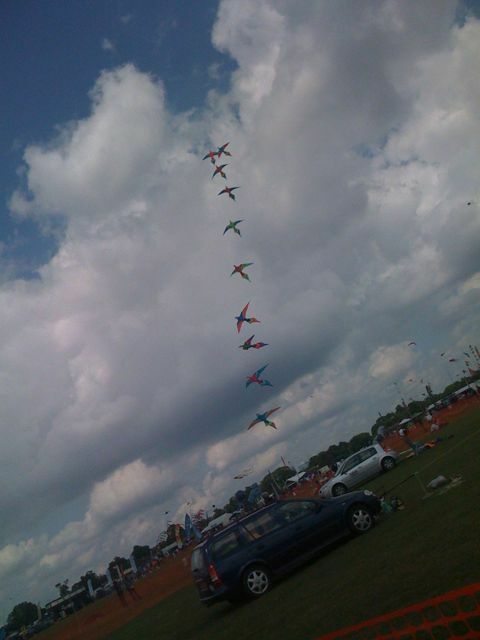 If you’ve taken any photos or videos of the Blackheath Bike and Kite Festival, please add them to the comments below. And a question – do the local council make a profit from the Bike and Kite festival? My initial assumption was no, until I saw the number of traffic wardens roaming around over the weekend… They looked like they were issuing a bumper crop of parking tickets! If you didn’t manage to go to the Bike and Kite festival on Saturday, then try and go on Sunday. It was really something special, as the video above by YouTube user Jadepike4 demonstrates. 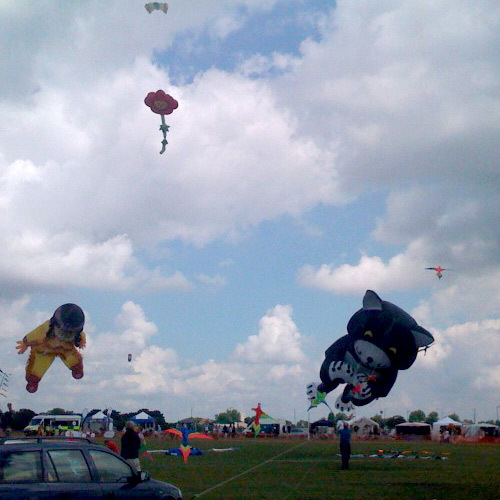 There are always two distinct camps of kite fliers: The model fliers, like inverse puppeteers with their enormous hovering cats, people and teddy bears looming over us. And the stunt fliers, flinging their synchronised kites through the air. I wonder whether the two tribes get along. Do the stunt fliers look down on the modellers as tacky and gauche? Do the modellers think of the stunt fliers as showy and macho? Or maybe not. Maybe they’re just happy to be up in the air. 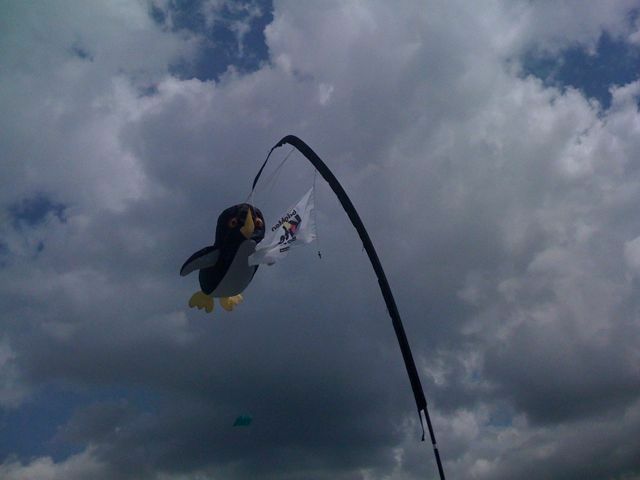 Here’s an idea for next year – one up from the flying cats (great though they were). In the 16th Century, the Chinese invented a man-lifting kite. This would draw in the crowds next year! Okay, it may be a little dangerous, but could be very exciting too… Perhaps I’ll volunteer to get hoisted up. Makes a change from attaching an old Nokia to a kite. Click on the Keep Reading link below to view my hundreds of photos – apologies for the dodgy quality, there are far better ones inside the Flickr Blackheath collection. UPDATE: This post has been modified from the original – please see the comments for details. The first kites! The cat is a truly brilliant kite. And Pocahontas, the blue bear (with trailing honey pot), and the flying flower are also pretty good. But the cat – it’s paws look as though it is swimming through the clouds! Such a great event – enough people to be fun, enough space not to be too crowded. Makes me love London. 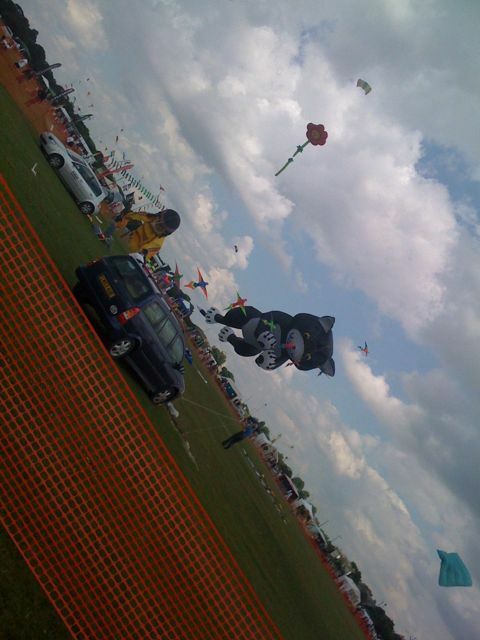 Blackheath Bike and Kite Festival 2009 Today! It looks like the weather may actually hold out – the beeb says it will get better throughout the day. If you’ve never been to Blackheath before, here’s a handy cut-out-and-keep guide (bring your special internet scissors). I’ll be adding lots of photos later today. UPDATE: At the request of the people in question, I’ve removed the photos on this post. I run a small B&B in the Lake District and last week four lovely Chinese ladies from Hong Kong stayed with us. One of them told me she would love to find her aunt who used to live in Blackheath – did I know how she could find her? Unfortunately she doesn’t know her aunt’s surname – she married a western man named **** and she would be in her 60s now. He, or she, (or maybe both) may be a doctor. But, vitally, the last known address was ** Kidbrooke Grove, SE3 (sometime in the 80s). Its a long shot but does anyone in Blackheath know of this lady or where she is now? I have a contact email address in Hong Kong for any info which I know would be very gratefully received. In this week of grim news about the fascists going to Europe, it’s a nice story – somebody must know something about the mystery couple… Let me know and I’ll pass it on. Hope we have more luck than with the Travelcard!